Changing Times: Opium poppy farmers Philip and Damien Jones want a re-think on American opium importation laws. Laxmi Lal Lohar is an Indian poppy grower who follows traditions thousands of years old. With his body bent over lanced seed pods, he laboriously scrapes the seeping opium gum with a curved knife. Phillip Jones is his modern counterpart, a Tasmanian poppy farmer with a combine harvester that cuts off the top stems and the pods for machine-crushing into poppy straw. Theirs is a business shrouded in the mystique of a dark history and a present that manifests itself in contra images of good and evil; of the chronically ill spared from unbearable suffering and of addicts roaming city streets in search of illicit heroin. It is therefore no surprise that the two men are a world apart, not only in time and place, but also in philosophy. Mr Lohar and the 159,000 peasant farmers licensed by the Indian Government are resistant to change. They grow and harvest their poppies as they have done since long before British colonists smuggled Indian opium into China and established Hong Kong out of the carnage of the opium wars. They are the only poppy growers in the world permitted by the International Narcotics Control Board to lance and “milk” their seed pods. It is claimed the gum is more easily processed but critics of the method say it uses too many solvents that are environmentally unfriendly and it produces an excess of morphine to codeine, which heightens the risks of increasing the flow of illicit drugs. The critics say the method is inefficient and sustainable only in a low-cost economy; it is propped up by a 20-year-old United States trade regulation – the 80-20 rule that ensures the world’s biggest drug industry buys most of its opium requirements from India and Turkey. For the past three seasons the Tasmanian growers have been producing a new narcotic-free poppy that is rich in the chemical thebain from which oxycodon, a new type of pain killer, is produced. Oxycodon has quickly found a place in the manufacture of pain-relief products for cancer and other chronically ill patients, especially patches that provide a slow and constant release of drugs for up to three days. Thebain will never replace the codeine-producing opium poppy, but as oxycodon becomes more widely used in pain management it will help authorities stem the overproduction of morphine. Mr Jones, who runs a merino stud and mixed crop farm at Broadmarsh, 40 kilometres north of Hobart, says it is impossible to tell the two plants apart at any stage of the growing cycle. Tasmanian Alkaloids, a subsidiary of the US pharmaceutical giant Johnson & Johnson, supplies him with the seeds. “They come marked in separate bags and it’s my job to see they are grown in different fields and harvested separately,” he says. He rotates the poppies with other crops but says the shots are called by five field officers employed by the Poppy Advisory and Control Board, which is an arm of the Department of Justice. Mr Jones says the field officers decide where the poppies will be grown and when they will be harvested. In summer, as the heads ripen, the field officers are joined by a patrol of 12 police from the drugs squad to prevent theft. In Tasmania, it is illegal to enter a poppy field and possession of poppy material attracts a $3000 fine or up to two years in jail. 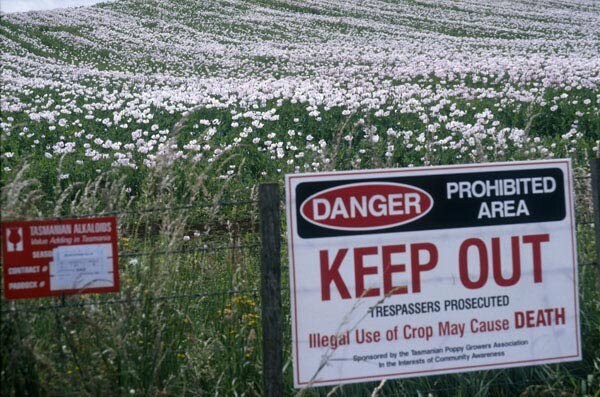 Tasmania grows poppies under a 1961 United Nations convention designed to provide the world with sufficient supplies of opiate-based pain-killers. It was chosen by the International Narcotics Control Board because it straddles the 41st parallel where growing conditions are ideal and, as an island state with a small population, it is considered a low security risk. The Tasmanian poppy industry has been developed over 30 years and has grown into a $200-million-a-year export business. It is poised to dominate world production if the US can be persuaded to drop the 80-20 rule. Tasmania’s growers have the support of America’s two opium importers, Mallinckrodt Inc and the Noramco unit of Johnson & Johnson who contend the rule, adopted in 1981 by the Drug Enforcement Administration to stem an excess of production, has become outdated. They have told the US Government the demand for morphine is growing and unless the rule is changed they face the possibilities of future shortages. The two importers say also that India and Turkey cannot supply enough of the thebain derivative and last year alone the domestic sales of the pain-killer OxyContin increased by 95 per cent to $US600 million ($A1 billion). Mr Stuart says the US has temporarily relaxed the 80-20 rule to boost thebaine supplies but Tasmania’s supplementary permit is reviewed six monthly and does not give the producers the long-term security they need for their products. He says if the US allows a gradual increase to 60-40, the growers will be able to meet the demand as it grows. The alternative, the retention of the 80-20 rule, will only encourage India to step up its production. However, a dry summer in Tasmania has produced a bumper alkaloid-rich crop of more than 125 tonnes and for the first time the world has a significant surplus of opium. This is worrying the International Narcotics Control Board, which is responsible to the United Nations for maintaining an adequate supply of narcotic drugs for medical purposes while keeping the lid on the illegal drug trade. In its annual report, released in February, the board predicted that the yearly aggregate consumption of opiates was likely to fluctuate within a narrow range at about 235 tonnes in morphine equivalent for the next few years. Production in 1998 reached 281 tonnes and provisional figures for 1999 suggest it reached 415 tonnes, resulting in surpluses of 46 tonnes and 175 tonnes. The report revealed that the board had informally encouraged the governments of Australia and Turkey to consider gradually reducing the production of poppy straw in the years to come. It also urged the US to think carefully about the way it reviewed the 80-20 rule.